Little is it known that Kataragama, the centre of the Skanda cult among Hindus and Buddhists, has a place in Muslim hearts as well. 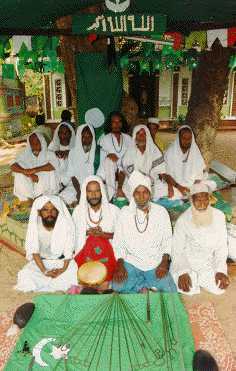 The sanctity attached to the place by local Muslims revolves round not on Skanda, but a mysterious being called al-Khidr or 'The Green One' whose presence is believed to pervade the sanctuary with which he is associated, namely, the Khalir Makam in the Muslim quarter of Kataragama not far from the Menik Ganga. Indeed, there are those who believe that it was this Khidr who gave his name to Kataragama. That the area was formerly known as Kadaragama is borne out by the Dhatuvamsa of Kakusandha written in the 13th or 14th century. Be that as it may, the Muslim association with Kataragama goes back to hoary antiquity though we cannot say exactly when it all started. Al-Khidr literally means 'The Green (one)', though Muslim commentators are not agreed on who he exactly was. Some say he is a prophet while others say he is a wali meaning one who is close to God, in other words, a saint. There can however be no doubt that it is he who figures in the Qur'an as the unnamed servant of God who initiates Moses into the mysteries or rather paradoxes of life. Around this mysterious personage have grown a number of folk beliefs in various parts of the Muslim world, especially in Asia Minor and the Near East. The mystical tradition of the Sufis has it that he is immortal, having drunk of the Maul Hayat or 'Water of Life' though one wonders how this could be reconciled with the statement in the Qur'an that every soul shall taste of death. Sanctuaries dedicated to Khidr are said to exist in Samandag in Turkey, Samarqand in Uzbekistan and Bhakkar Island in Pakistan. 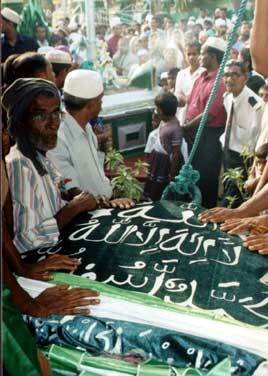 The Muslims of Sri Lanka know Khidr by various names. He is called Kilur, Kalir or Halir, all derivatives of the Arabic Khidr as well as Hayatun Nabi or 'The living Prophet'. This is in spite of the fact that it is Prophet Muhammad who is considered the last of the prophets in Islam. The rituals that have grown round Khidr here are however somewhat different from those existing in other parts of the Muslim world and show considerable South Indian influence, especially with regard to customs such as the flag-hoisting which constitutes an integral part of the local tradition. One of the earliest notices concerning the visit of Khidr is provided by Hugh Nevill in The Taprobanian of April 1886. 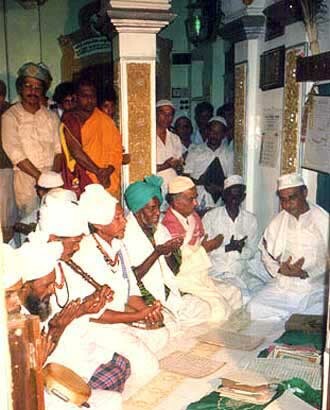 Here he records a tradition that Al-Khidr made a pilgrimage to the Kataragama Hill where he did penance and prayer. At Kataragama, it is said, he found the 'Water of life" and drank thereof, though tradition is uncertain as to which of the streams there supplied this water. Nevill records that the spot where Al-Khedr resided during his penance and prayer at Kattiragam is still visited by occasional Arabian and other Muslim pilgrims, especially Shias who there hoist a flag in his memory and perform memorial worship. To this day such rituals continue including the flag-hoisting with which the ceremony commences. The ceremony itself is known as the Kataragama Makam ceremony and interestingly enough coincides with the Esala Perhera of Kataragama. The ceremony which lasts 16 days commences with the Kodiyettam or flag-hoisting and is followed by daily mawlud recitals and nightly rifai ratibs before concluding with a grand kanduri feast. For instance, this year's ceremony began on the evening of July 29 with the hoisting of the flag and concluded on August 13 with the grand feast which we found rather heartening though it lacked the meat characteristic of other kanduri feasts, a concession to the area's largely non-Islamic environment where meat-eating may be regarded as sinful or even sacreligious. The Makam ceremony evidently takes its name after the Makam or shrine of Khidr situated in close proximity to the Valli Amma Kovil. This shrine is known as Khalir Makam or 'Khidr's Sanctuary' as it is believed that Khidr resides here. According to the Trustee of the shrine, M.H. Abdul Gaffar, who imbibed his Sufi lore from his master Zuhrudin Alim, Khidr is like air. When one thinks of him, he is there. His presence is especially believed to pervade the Khalir Makam where homage is paid to him in the form of mawluds, especially during the Esala season. Abdul Gaffar recalled that the area was formerly jungle and that his father and grandfather would trek twelve miles from Tissamaharama to the spot. The place was then sparsely populated and seems to have been largely inhabited by Sufi faqirs. 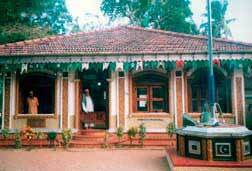 The Khalir Makam was then a very simple place and known as Faqir Madam or 'Mendicant's Station' after the faqirs who would meditate there. Among the faqirs who resorted here were Palkudi Bawa or Jabbar Ali Shah who had come all the way from his hometown in Bukhara and one of his more notable descendants, Meer Seyed Muhammadali Shah whose mausoleums are still to be seen in the vicinity of the shrine. 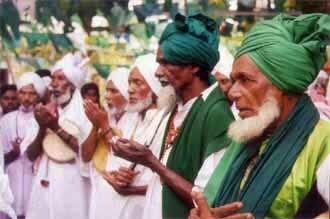 Abdul Gaffar who claims to have visited Kataragama since 1952 and has served as its trustee since 1983 said that in the olden days, the Muslims here resorted to 'shrine worship'. They would keep vows and holding their ears go round the shrine seven times. They would also request the awliya or saints directly for favours instead of taking them as intermediaries between themselves and the Almighty. These shirk or heathen practices he claims to have purged from the sanctuary, though we noticed that many women resorting to the shrine still took oil from a lamp surmounted by a crescent which they applied on the hair of their offspring, a practice which would be considered rather unislamic by pious Muslims. Indeed there are those orthodox sections who argue that even the practices presently associated with the shrine may not fit into the Islamic scheme of things as anything beyond the practice of the Prophet they consider anathema to the faith. Supplications, they argue, should be directed to God and to God alone and not through an intermediary. Thus one sees here conflicting views on the place Kataragama should hold in the eyes of the faithful. Whether it be vested with sanctity or divested of its ritual only time will tell. Yet for now Khidr lives, if not in flesh and blood, then certainly in the hearts and minds of those who believe in him.